The ground had barely stopped shaking from the powerful earthquake that rocked Mexico City on Tuesday before rescue efforts were underway. Many buildings had toppled during the 7.1 magnitude quake, sparking a hurried search for survivors amidst the rubble. But while the death toll sadly continues to rise, scenes of hope have emerged that show the dedication of those countless volunteers who've stepped in to help both human and animal victims alike. One poignant rescue after the earthquake is quickly going viral. Digging through the remnants of one collapsed building on Tuesday, emergency crews happened upon a dog who'd been trapped beneath the debris — confused and frightened, but miraculously still alive. Footage shows the pup carefully lifted out of the ruins, tenderly being pet by those who had just saved her. And as she's revealed to the crowd of volunteers below, appearing to have survived without obvious injury, they burst into applause. The status of the dog's family is unclear, but her survival in that moment clearly bolstered hopes that they, and others trapped throughout the city, too would be found alive. Elsewhere, other scenes of solidarity have been carrying out as strangers come to the aid of pets displaced by the earthquake. A forum has been established on Twitter for people whose pets are missing, and for those who've taken in lost pets for safekeeping. But while many dogs are being rescued, some are actually doing the saving. 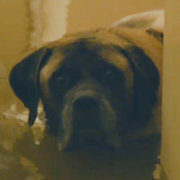 One search and rescue dog, named Titan, has reportedly led to the safe recovery of 21 people who had been trapped alive beneath rubble — and his work is only just beginnning. 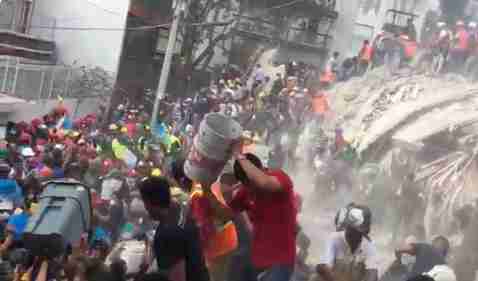 To make a donation to the relief efforts following the Mexico City earthquake, check out GoFundMe's list of verified fundraising campaigns.